Also Browse the News Stories for more detail. Birmingham City Council Votes For Moratorium (12/06/11). The Birmingham City Council voted to enact a six-month moratorium on any new locations inside the city limits. Click here to view the moratorium. Birmingham City Council Hearing (11/15/11). The city of Birmingham legal department presented a revised version of the moratorium today and the council also conducted a hearing on the proposed moratorium. After the testimony the council agreed to again delay the vote for a moratorium for another three weeks to further study the legality and the impact of the proposed moratorium. If the proposed delay holds then the council will next bring the matter up for a vote on Tuesday, December 6, 2011. Be sure and click on News Stories to review the news coverage from that event. Let us also mention that we have been advised by more than one city council member that every community in the state is watching what is happening in Birmingham. And that they fully expect what happens in Birmingham to be a template for other communities in Alabama. It would be very unwise to expect this not to have statewide implications in communities across our state. If the moratorium is approved you should expect it soon in a community near you. Birmingham News Story (11/13/11). The Birmingham News published a story in today's edition ahead of Tuesday's hearing. The story was expected and we were able to work with the reporter to be sure our side was represented. You will notice the reference to our "real estate expert" who submitted an excellent piece regarding the real estate side of the argument. We will distribute his work along with a briefing book to the press and to the city council members tomorrow. The book is a comprehensive work that addresses all of the issues raised by the council and uses some well documented and independent sources of information (Federal Reserve studies) to counter the cities misguided claims. We will use this book during our presentation at the hearing and provide you all with a copy as soon as we can. Click on News Stories to read the story. Moratorium Hearing Is Set -- Update (11/4/11). The hearing for a moratorium against the short-term lending industry is now set for Tuesday, November 15, 2011. The exact time of the hearing is not yet known. It is expected the city council will take up a vote the following Tuesday, November 22nd. Check back later for updates as more information becomes available. City Councilors Indicate Moratorium May Effect Current Licenses -- Update (10/19/11). During individual meetings with some council members over the last week or so they indicated that licenses which are now being renewed for existing licensees could possibly be affected by the moratorium issue. We will work to get more information since licenses are currently being processed for 2012. Borrow Smart Team Member Makes Presentation To "Council of The Whole." A Full Hearing Is Now Set. -- Update (9/26/11). Mr. Jamie Sullivan of Advance America (CFSA) made a presentation to a sub committee of the Birmingham City Council. The council subsequently agreed to delay consideration of the moratorium for six weeks pending a full legal review and public hearing. We expect the public hearing on this issue to occur before November 15, 2011. The hearing may well occur at an earlier date at the discretion of the city council. Industry Group Retains Legal Counsel & Meets With City -- Update (9/26/11). This is a member only update. Members please click here to login. After login return here and click this link. 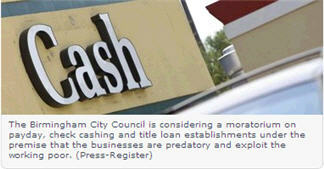 Short-Term Lending Moratorium In Birmingham Is Announced (here) -- Update (9/13/11). A moratorium against all short term lenders in the city is announced. Essentially, the objective of the moratorium is to limit the growth of short-term lenders and reduce the number of retail locations. Here is the moratorium document.